Sawyer’s proprietary hollow fiber membrane filters are small, portable, easy-to-use, reliable, inexpensive, and can last a decade without needing to be replaced. Our filters are certified for ABSOLUTE microns making it impossible for harmful bacteria, protozoa, or cysts to pass through. All of our filters remove 99.99999% of all bacteria, such as salmonella, cholera and E.coli. They also remove 99.9999% of all protozoa, such as giardia and cryptosporidium. Just drink: no pumping, no chemicals, no waiting, no worries! Incredibly fast flow rate, simple to use, and each filter can be backwashed to extend its life. Our most popular filter just got smaller and lighter. 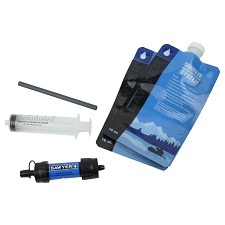 The Sawyer MINI Water Filter is rated to 0.1 micron absolute, weighs only 56 grams, and filters up to 300,000 litres! This award winning system is reliable and easy to use. The MINI can be attached to the included collapsible drinking pouch, inline on a hydration pack, on a standard soda bottle, or simply use the included drinking straw to drink directly from the water source. How is that for versatility? Like all Sawyer filters, a proper backwashing can restore up to 98.5% of the filter’s flow rate. That means no expensive cartridges to replace, ever. Want to see more? Check out this video https://vimeo.com/75341361. 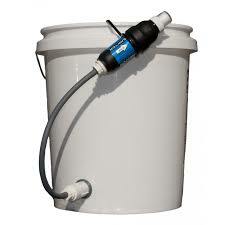 With the same 0.1 micron filtration level as the Mini, the Sawyer PointONE bucket filter is designed for larger groups. We’ve made it as simple as it gets. No more digging wells if there is a water source, no constructing sand filters, and no more purification chemicals. No one has to boil their water to make it safe ever again. Families are able to hook up their filter literally in minutes to almost any locally found container. The gravity-operated filter and fast flow rate mean anyone, anywhere can have clean water in a matter of seconds. See for yourself how the Sawyer bucket filter systems are changing lives around the world https://vimeo.com/66605457. For more information, please contact Future Strategy, the southern Africa distributor for Sawyer products.